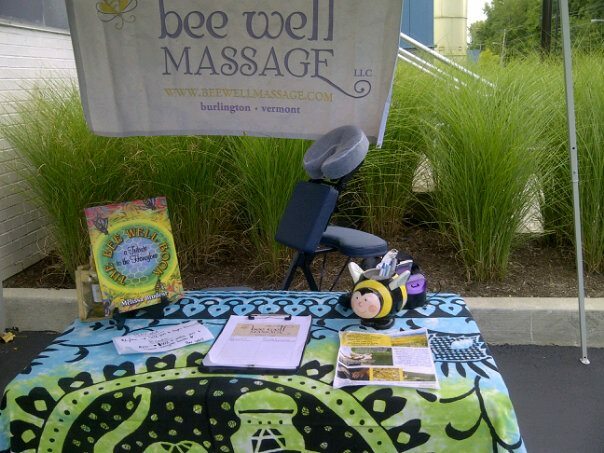 Please consider Bee Well Massage for your event. I am available for all types of events. I will attend a social gathering of any kind. These gatherings could anything from health fair's or retreats to wedding, holiday or even a going away party. I could work at a public fund raiser, BWM will proudly donate a percentage of money earned to any fund raiser event I will be working for. Even if you never thought of a massage therapist at your event, that is the event I would like to do most! Please contact me for more information about rates. I am confident that with my massage experience I can add a professional, healthy, creative and fun addition to any event. Bee Well Massage LLC is insured Beauty and Bodywork Insurance Co. Bee Well Massage practices therapeutic massage only. I use all proper draping procedures. Some travel rates may apply.